Serene, tranquil and calm-that’s the kind of life most people desire post retirement. Billed as the idyllic retreat for one’s later years, senior housing is promptly gaining traction among those who desire an independent lifestyle away from the humdrum of city life. Already a popular concept in the West, the trend of retirement communities is beginning to find a market in the Indian context. Senior housing is becoming popular in and around cities such as Pune, Kochi, Bangalore, Chennai, Mumbai and Delhi NCR. Retirement homes typically include enhanced features that can make living for the elder far more secure and comfortable. Advanced medical facilities in and around the area, high-tech security systems, recreational choices especially designed keeping this clientele in mind and other superior facilities are a part of these communities. The concept of retirement homes itself is undergoing a major metamorphosis from its erstwhile image of being charitable institutions with minimum facilities to self-sufficient special communities/townships. Hence, it is likely to gradually move from being sentimentally sensitive to aspiring more of independent living. In fact, couples who are likely to retire in about 15-20 years are also a potential market, along with other groups such as NRIs. Aligned with the special needs of the elderly, senior citizen homes provide residents with all that they require. 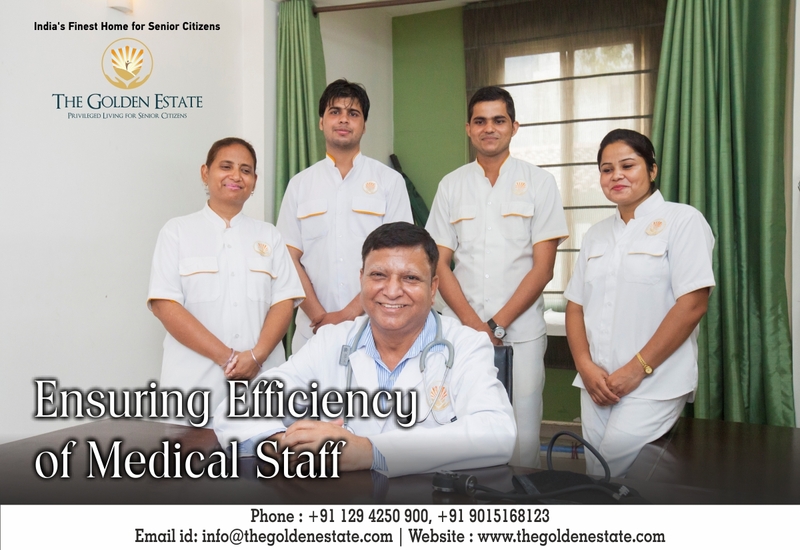 Under this genre of homes, The Golden Estate is a perfect abode where all facilities and comforts are tailor-made to ensure complete physical, mental and psychological well-being of the elderly residents. TGE understands that the last phase of a rewarding journey is the most satisfying. You have invested many precious years in bringing up your kids and have gained a respectable status in the society. 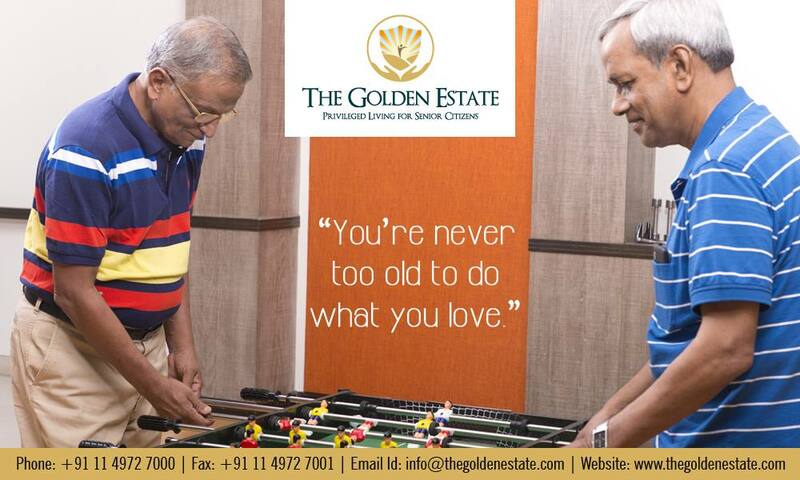 The Golden Estate is a place for people who desired for a premium and independent life after their retirement. This is one perfect place where one can feel relaxed, happy and dignified. Owning a home, fully equipped to make life easy as it gets was never so easy, but at TGE, it has become possible. Senior housing in India caters to today’s active adults. Thanks to the collective power and sheer numbers of baby boomers and the generations preceding them; senior communities have undergone revitalization in the past few years. They cater to the desires of the 55-plus population who aspire for a reputed, comfortable and independent life. In the past, people didn’t have many choices when it was time to move out of their family home. Fortunately, retirement communities have made great strides since then. If you have never visited one of today’s active adult assisted living retirement communities, you’re in for a pleasant surprise. Long gone are the sterile, rigid, “institutional” environments associated with nursing homes and old age communities. Communities now promote active living and offer a variety of lifestyle options to fit people’s needs, allowing them to age in place. As populations in these communities are rapidly growing, so is the sense of community and accompanying benefits within them. Fortunately, people of today’s generation have wide choices of lifestyle to pick from. And a continuum of care retirement community can be a very good option. If we talk about the retirement homes, then in today’s time, 55+ retirement communities are different from those of the past and they should not be confused with nursing homes or assisted living facilities. They are independent living; age-restricted residences for those who want to downsize and live a more maintenance–free lifestyle. Many times, older adults move to these communities when their spouses pass away, when they are recently retired, when their family home seems too large to manage, or are simply planning for a new chapter in their life. The Golden Estate offers this style of living, which allows older adults to remain autonomous, but offers specific amenities such as maintenance-free living, structured activities, socialization and a sense of community. It also offers round-the-clock security, various size residences, numerous amenities, opportunities to enjoy the outdoors, and more. Realizing that you or your loved one is ready to move to a 55+ community is the first step in this new phase of life. Downsizing and transitioning from a home full of memories and good times can be challenging. However, as you begin to weigh the pros and cons of making a move like this, you quickly begin to see all the advantages 55+ communities have to offer. Moving to a retirement community means understanding that although you aren’t as young as you once were, there is still plenty of good living to do. Our ownership structure is designed to create and preserve a thriving community of the like-minded people and ensures our residents have a consistent and hassle-free life at senior housing The Golden Estate. The ownership structure ensures that both the asset and the finances of our residents are securely protected and managed by us, to give them clarity and peace of mind. 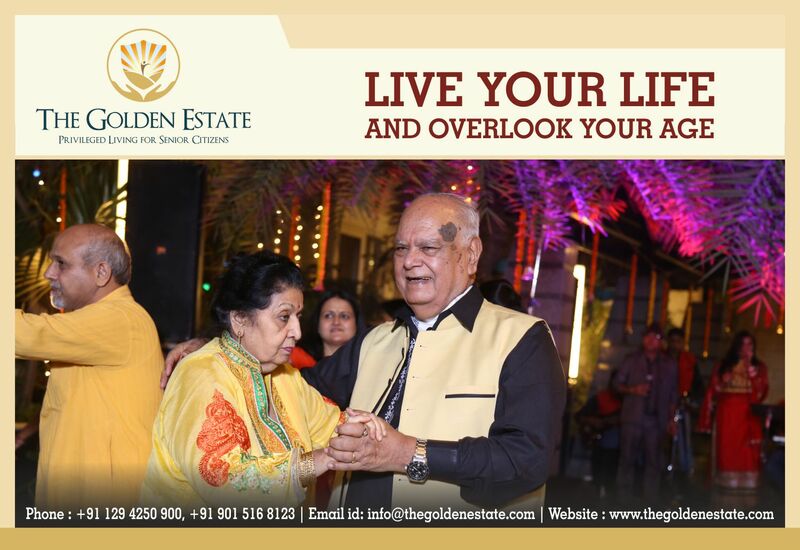 Contact one of the best retirement homes in Delhi ‘The Golden Estate’ to spend best days of your life without any worry. If you are confused of what life holds for you after your retirement then your answer is The Golden Estate (TGE). Visualize an adorable residence for your after retirement days where you can indulge in an independent and comfortable life filled with entertainment and luxury. At The Golden Estate, you can experience these all. This senior citizen home offer best-ever modern amenities and dedicated residential services to make life after 55 a stress-free, self-reliant and enlivening experience. At TGE, we thrive in providing residents with lavish environment with impeccable infrastructural advantages. 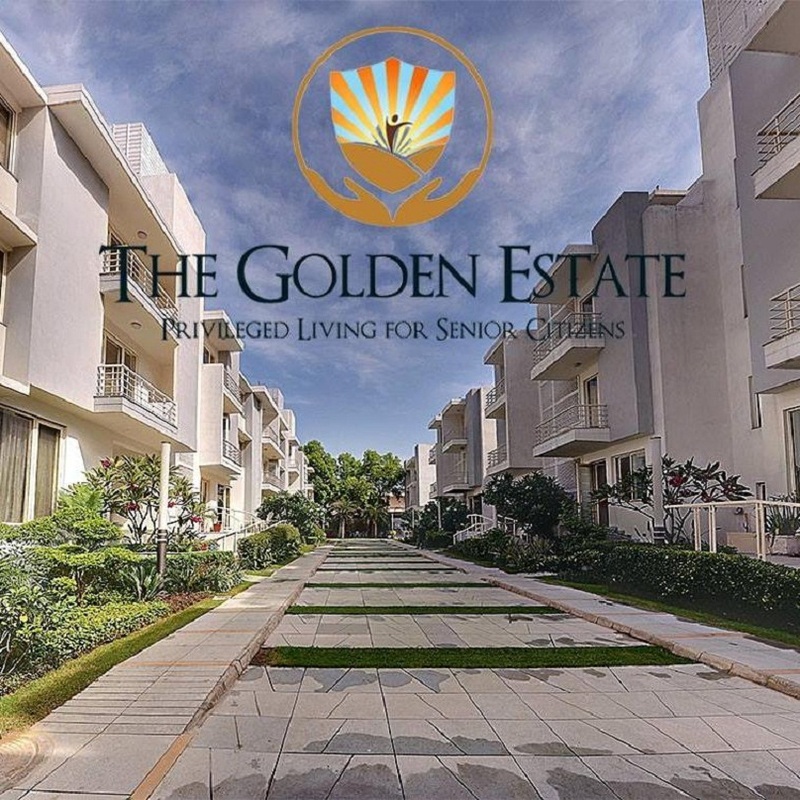 The Golden Estate is a leading retirement premise for senior citizens in the list of top private old age homes in Delhi. At TGE, we deliver world-class services to our residents and try to make them feel like relaxed and free. While discussing about paid senior living homes, it’s important to consider not only the needs you have now, but also those you may have in the future, such as physical and medical needs. The Golden Estate considers that ideal senior citizen homes India should remove the stress out of everyday living, because after an age, even regular household chores seem cumbersome. Keeping in mind every trivial detail that can make a significant difference, we constantly strive towards offering dependable residential services that can release the burden from our residents. Finally, as the core of our concept, we would like, The Golden Estate to foster an active retirement life rather than just playing the role of a passive retirement home. We believe that the way we organize and manage recreational activities and events for people above 55 years of age will not only nurture good health and great spirits in them but will also enhance the overall vibe of the community. 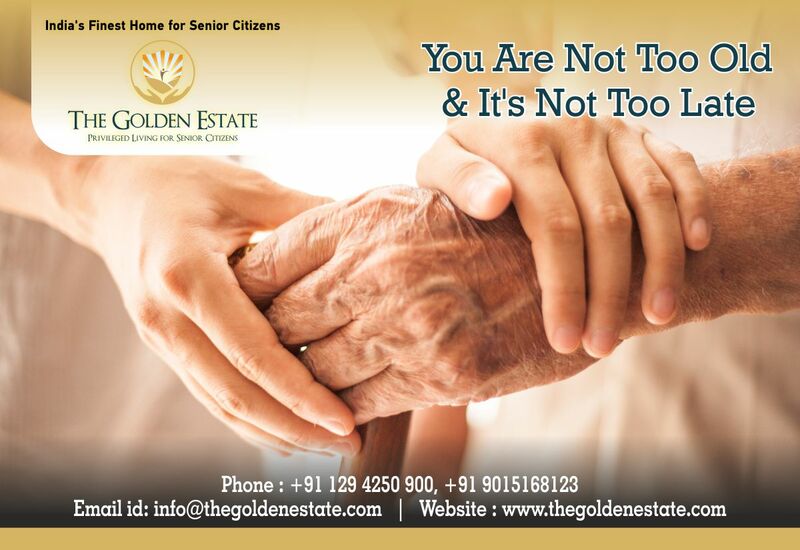 Therefore, instead of wasting time, if you want to experience a luxury lifestyle then opt for one of the best retirement homes in India – ‘The Golden Estate’. 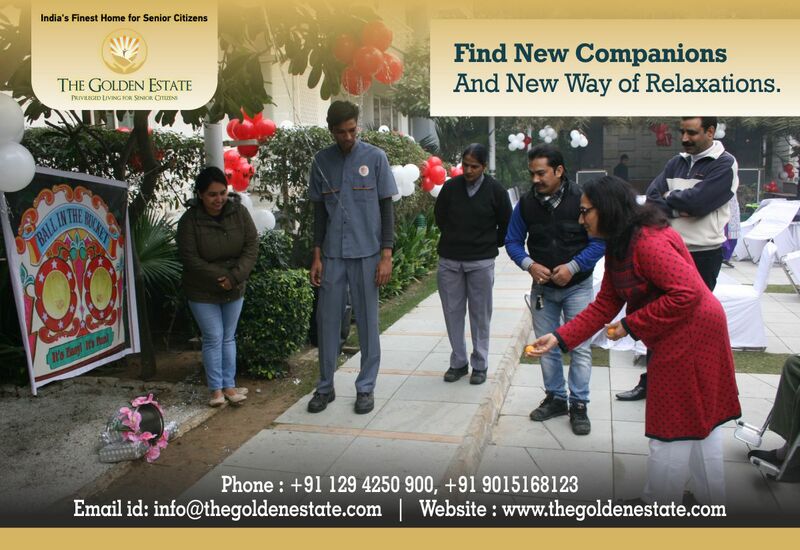 The Golden Estate, as the name suggests, is the most celebrated paid senior citizen homes Delhi (NCR). The Golden Estate is the home away from home for the Senior Citizens wishing to live a worry-free life in their retirement years, in a serene atmosphere where one can interact with nature. Opting The Golden Estate is like getting best way of life that makes aging a real privilege. The modern senior living homes are constructed to provide an ideal retirement life for senior citizens. This senior living community signifies a complete living setup specially designed for senior citizens. Each of our team members leave no stone unturned when it comes to fulfilling the requirements of the elderly people. Apart from providing modern amenities, we also offer tasty foods that are well-liked by our senior citizens, and which will also not harm them in anyway. 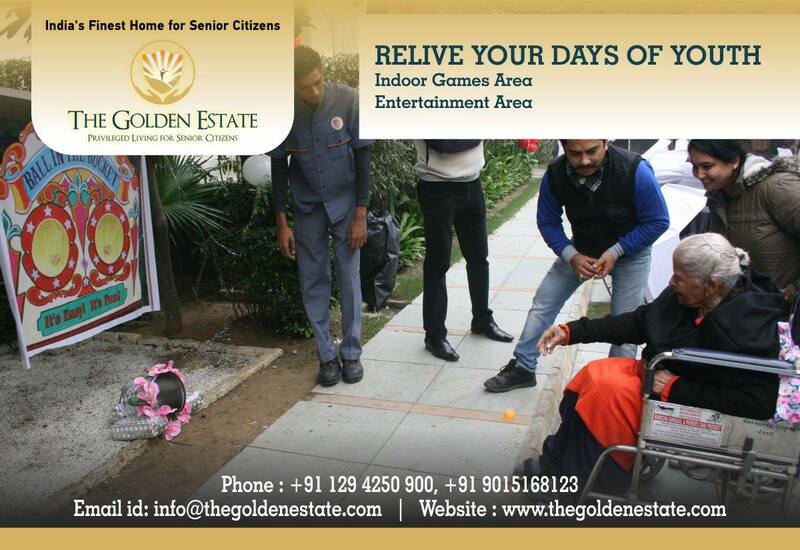 All this facilities and services make The Golden Estate one of the best senior citizen living homes in India. The residential property is something beyond from these basic requirements. After a certain age, it becomes difficult for a person to take care of themselves if no one is there to look after. At our senior living residential community, we involve a team of skilled staff members who are available 24×7 for fulfilling the necessities of residents. It is a place where a person can re-live every moment of his life leaving all worries behind by participating in several activities which are organized on numerous occasions. So, instead of wasting time in finding a new ambition after retirement it’s better to opt for senior citizen care center ‘The Golden Estate’ where you will make new friends and get quality time to spend with your loved ones. Senior citizens believe in living an active and healthy lifestyle. However, we understand the challenges that ageing presents, and thus, build our homes in anticipation of those challenges. The Golden Estate is designed to have all the comforts of a regular home with additional functionality and detailing to suit your needs. Step on to anti-skid tiles across the apartment floors. Turn into the hallway and run your hands along chamfered wall edges designed to prevent injuries. The bedrooms have easy-reach, coloured light switches and night switches that swiftly bring forth the safety of light. Emergency response system at the locations in the unit, upon activation, will alert the security immediately to come to your aid. These above facilities make The Golden Estate one of the best senior citizen homes India. The Golden Estate is a renowned senior citizen accommodation and is a home away from home for the Senior citizens who wish to live a full, worry-free life in their retirement years, in a serene atmosphere, where one can commune with nature. The TGE is a premier lifestyle option that makes aging a real privilege. TGE is seized according to the need of rapidly ageing elders who now want to lead an independent life with respect and dignity. As one of the leading retirement homes in India, The Company took a decision to develop a world class facility; matching standards of old age care in developed nations albeit with a difference. By identifying the approach of elders of India who above anything value mixing with the younger generation and in company of people with a similar profile; The Golden Estate has decided to develop the retirement home as part of a larger mixed generation community, a concept that will replace ISOLATION with INCLUSIVENESS. So, be part of our community and experience the topnotch senior citizen home care. Senior Living home is a great place for our elders where they can spend their leisure years with a dignified and luxurious life style. Elderly care emphasizes the social and personal requirements of senior citizens who need some assistance with daily activities and health care. The main measure of being helpful for the elderly is to love them and keep them active. Here, we provide great facilities of recreational activities to them like playing indoor games, connect themselves to the outer world with the help of social media, picnics yoga programme etc. to make them fit and healthy. The retirement years should be enjoyable. In fact, some say they’re the best years of life since you don’t have to deal with the stresses of mortgage, kids and jobs. This is a fact only those people choose that senior living residential community who has the physical and mental capacity to live independently but want companionship from others his/her age. And senior living homes provide not only socialization; it also provides fun activities and stimulation. The Golden Estate best among India’s luxury retirement living home for senior citizens‎, emphasis on creating one big happy family midst “GOLDEN-AGERS” to provide them secure, confident life and where they can live well with dignity in a healthy atmosphere. Therefore, come to our premises and witness a life full of positivity and happiness. The non-existence of traditional family support system is giving rise to an increased number of nuclear families and around 9% of the population is 60+ which require a great need of support. The concept of retirement homes in India has been borrowed from US and Australian markets where it is quite popular. The concept of senior citizen accommodation is new and in prominence from the last 5 to 6 years. Today, a good number of realty players are finding their interest towards senior citizen homes India as they can see a good demand and they are actively focusing on building senior citizen explicit projects. Several charity groups and local developers are also participating on this niche market but there is no match between The Golden Estate and other senior citizen home care in India in terms of service, security and care. Along with the numerous facilities, we take take care of our residents in every aspect. No need to worry about your health at our premises because we involve a team of professional doctors who are available 24×7 in your service. Plus, at The Golden Estate environment is serene and full of positivity. So, come to our premises and experience what happiness is. Happiness is the cured of every problem in life. Staying positive is a much mainly for the elderly people. Stress and over thinking lead them into trouble. Sometime following a regular healthy lifestyle at homes is not possible and some fear from staying at senior citizen homes. Often most people find difficult to adjust at a new place and find difficult staying at senior’s citizen living home due to lack of facilities. But under The Golden Estate paid senior citizen homes Delhi you will not get such problems. At TGE, Senior Living Residential Community comes up with the most excellent top class facilities. Here you can enjoy the best quality services with free stress life with fully socialized and updated system. Moreover TGE team cares for your privacy and therefore there are multiple rooms like suite, Studio or large suite with easy payment amenities through short term and long term models. You can choose from short stay or long stay options according to their preferences and needs. As far as you are with The Golden Estate your problems are their concern. So take the opportunity and bring your happiness back again. 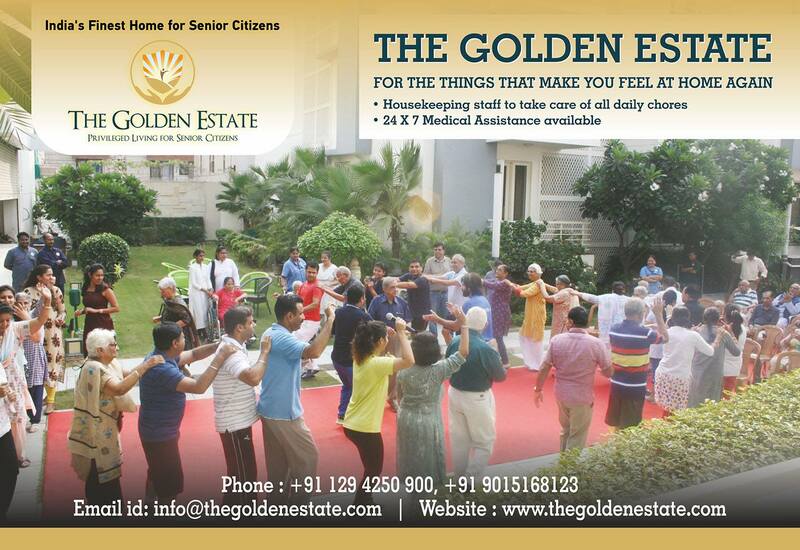 The Golden Estate is unlike any other retirement home in India. Enroll with TGE and make your decision the best decision in life. Old age is simply a ‘state of mind’. Enjoying life to the fullest can keep you young, as growing old is part of the life, no one can stop this phase but one can make sure that you spend this valuable time well and unforgettable. Participating in different activities can lead you an active life both mentally and physically. To give you a luxurious lifestyle in a safe, secure and rejuvenating environment. 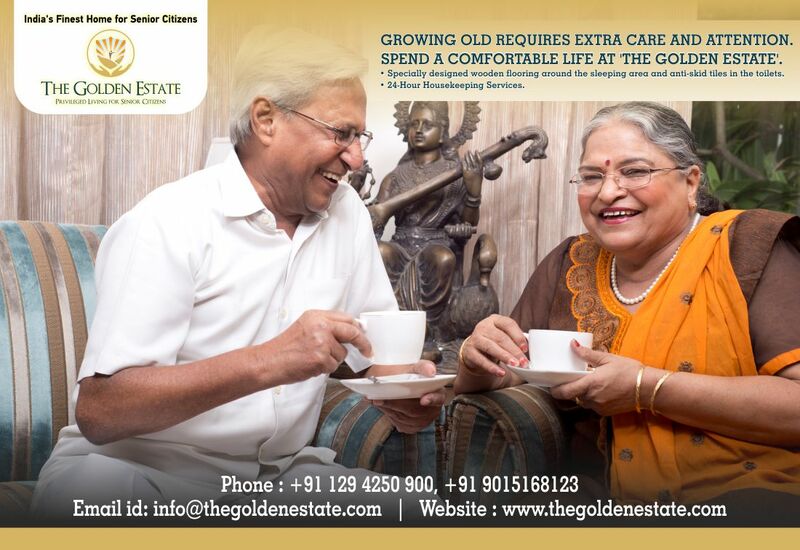 The Golden Estate, senior living homes in India bring you the ideal home care center for senior citizen people at very affordable price at the urban area with all modern types of equipment and best amenities. At Golden Estate, senior citizen home care, you can spend your quality time throughout the day. Watch movies in the common area, use the gym or practice yoga and meditation. The indoor games room is accessible to residents any time of the day. You could also surf the Internet or read books on various subjects available in our well-stocked library or get involved in socially productive work with NGOs. The Golden Estates retirement homes in India provides a wide range of finest services to the residents. Staying at The Golden Estate, senior citizen accommodation will definitely keep your mind in peace and stay fit in your old age. For further details and payment or security deposit, check out at the Golden Estate website. Life is short; cherish it and live without any regrets at The Golden Estate, Senior Citizen Home care.